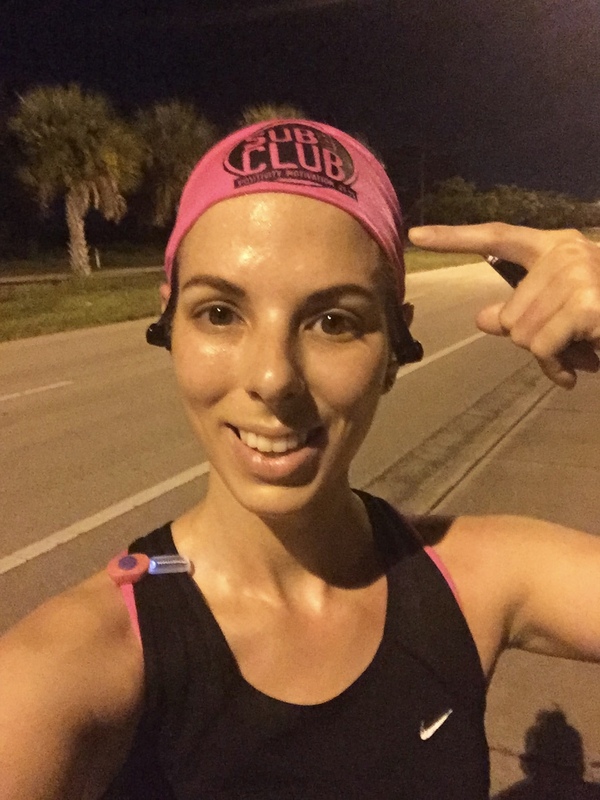 This year, when the Sub30Club rolled out its second annual Virtual Runner's World Festival races, I decided to run the hat trick. I felt like it would be a good challenge and the mileage would coincide nicely with my marathon training. Completing the hat trick meant completing a 5k, 10k, and half marathon between the dates of October 15-18. 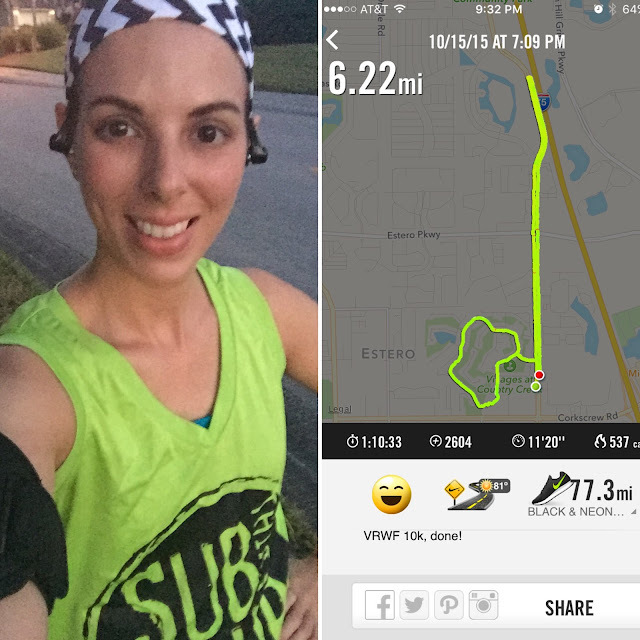 Thursday evening, I ran my 10k. I definitely felt my mentally shift this week, and this run helped to trigger that. There was nothing spectacular about it, but usually my weekday runs are 4-5 miles, and it felt good to have a real reason to push beyond my usual mileage. Saturday, I had the Sanibel 10k. I love this race, and this was my fourth year running it. Because I needed to get enough mileage to cover the half of the hat trick, I woke up at 4am and ran just short of seven miles. Then, I drove to Sanibel. Me: Bye honey, I love you. Him: Bring a towel; you're going to be so smelly! 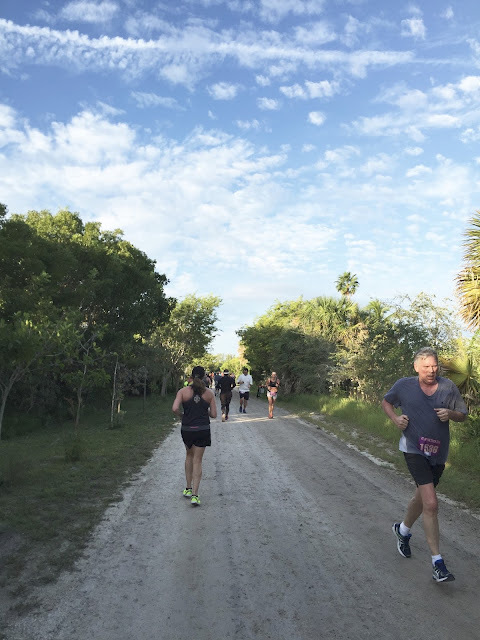 I timed my arrival at Sanibel to be just 30 minutes before the start, because I already had my bib and wouldn't need time to warm up. I parked and got situated, used the bathroom, etc, with plenty of time. In fact, almost too much time; my legs started to really cool down! I did some dynamic stretching to keep them warm and lined up toward the back of the start. My mentality for the race was to go very slow and very easy. I ended up finishing with possibly my slowest 10k ever, but I was perfectly happy with it! 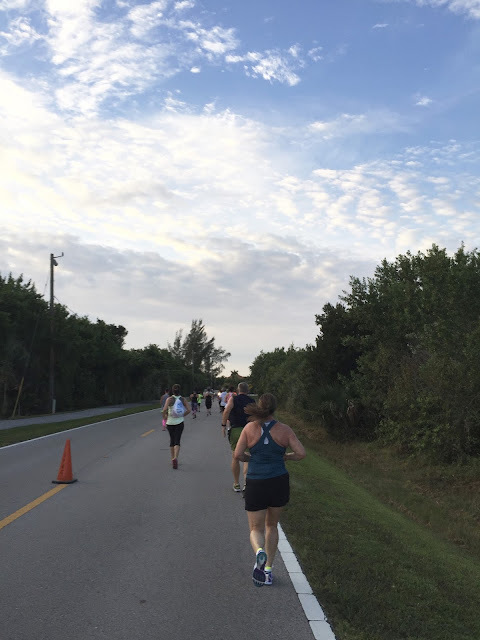 I was proud of how steadily I held my pace, especially given that I'd run beforehand. This is one of those races that attracts lots of inexperienced runners. Usually there's a lot of dodging and weaving in the beginning, but this year felt smoother. I did play leap-frog with a couple who were running/walking, and didn't seem to know that walkers should move to the side...That was a little frustrating to deal with the entire race. But you now, sometimes things like that just happen and we can't let it get to us on the course! 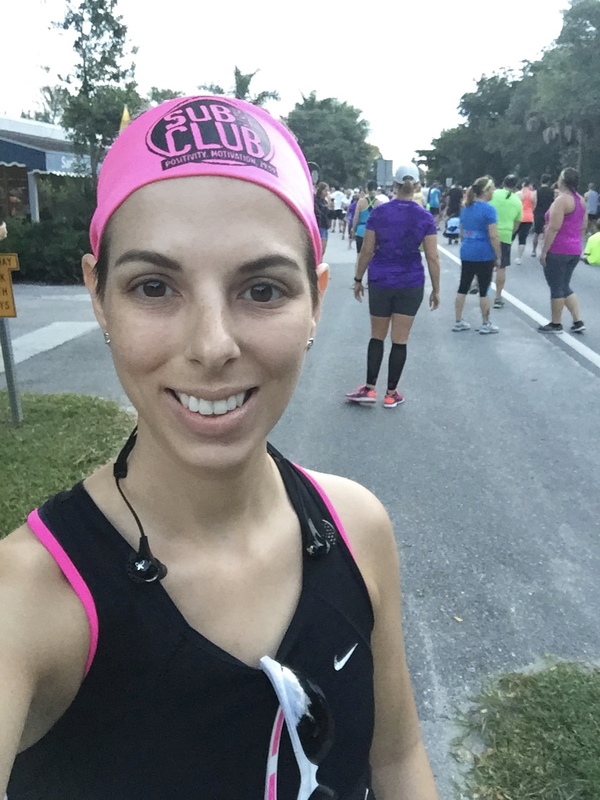 This was my first race of fall, and I got a little emotional in the first couple miles. 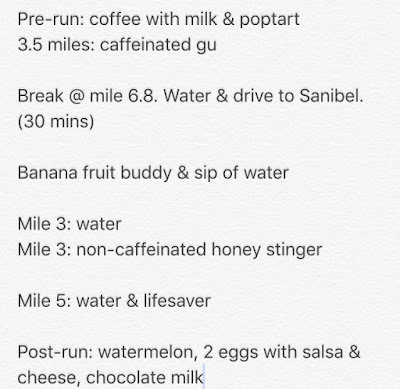 The most frustrating thing was being the only one who knew that the reason I was so lethargic toward the end was those earlier miles! 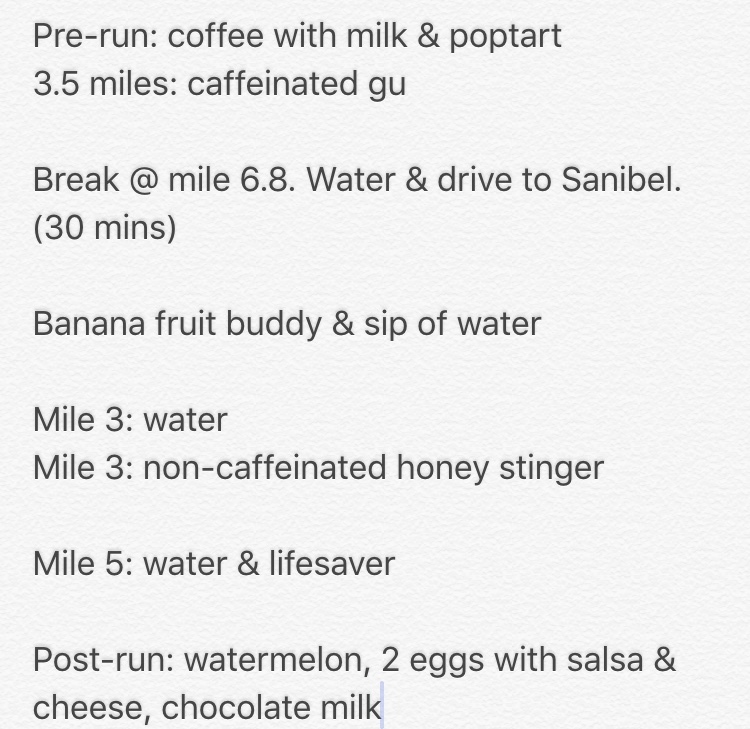 Around mile 5 I took a walk break while I unwrapped a lifesaver and a couple of ladies passed me; one said, "Come on, cutie! You're almost there!" I wanted to shout, "I'm usually much stronger in a 10k! This is mile 12 for me!" The packed-shell road from mile 4 to 5.5 is a little narrow, but I appreciated the shade! 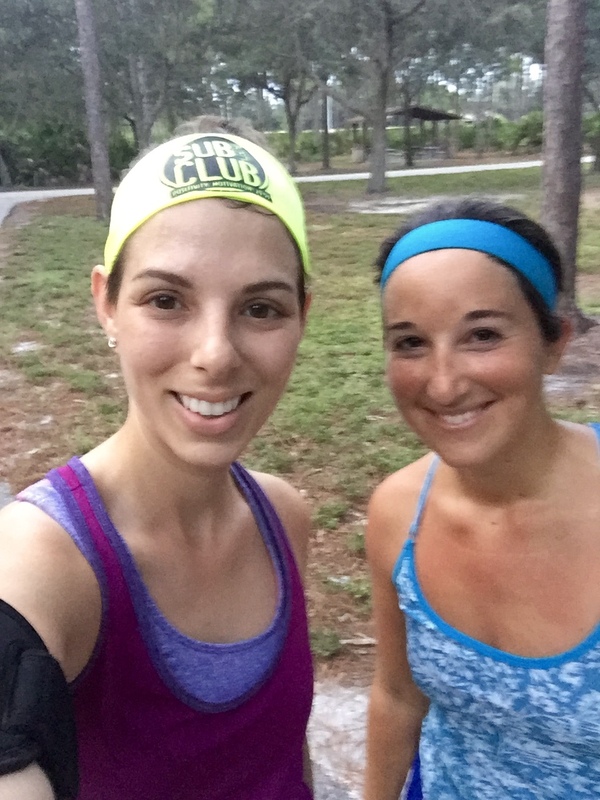 This was the first time I've run Sanibel without a buddy. Because of the logistics of running beforehand and Matt's own training, I went alone. I also had to head out immediately after finishing because Elizabeth was coming over with her husband to help with drywall in our kitchen, so I didn't enjoy the usual post-race celebration this year. Although I really enjoyed the race and got a little emotional at the thought of race season starting again, this one felt a little more practical than festive. 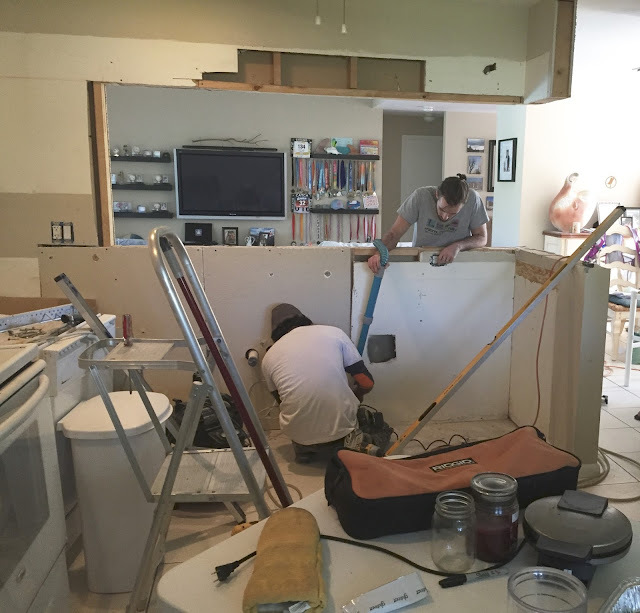 Roniel and Matt making progress on the kitchen. Obviously I'm going by chip time here. Total mileage and pace Saturday. Finally, Sunday was the last run of the hat trick: the 5k. Elizabeth joined me at 6:45 and we just went out nice and slow and enjoyed the morning. The temperature was 69 when we began, which was surprising and refreshing. My legs felt great! Elizabeth isn't really a runner (she prefers pretty much any other type of exercise over running) but wanted to come along. 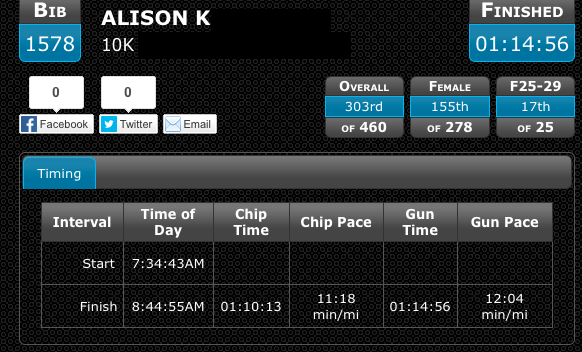 Three virtual races and my first real race of the season, done! 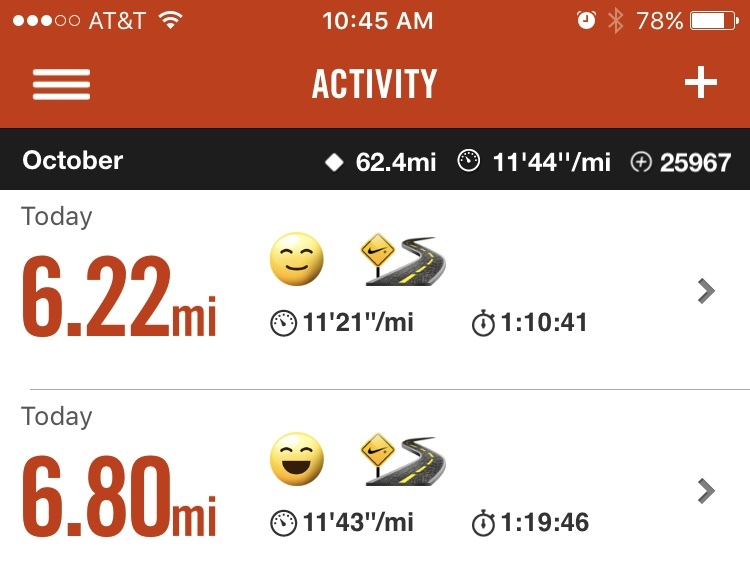 I'm feeling really accomplished and a little impressed with my mileage this week! 27 miles...not bad! I actually feel like I'm marathon training! Now, it's time for a much-deserved rest day! Do you like virtual races? I like that they motivate me to get running, but I don't really count them as a real race. Have you ever done a multi-race challenge over a weekend? Love that you did virtual races to celebrate the RW Festival and love that you raced in Sanibel. I grew up going there on vacation and miss it dearly. Would love to go down there again someday and would love to RACE down there even more! Isn't there like a 7 mile bridge to get to Sanibel and Captiva or am I remembering that incorrectly? Are there any races on it? Congratulations!! I did a virtual race back in April and I really enjoyed it! It looks like you really challenged yourself and I think your times look great! I hope to make it to the Runner's World Half next year, but doubt I'd attempt a Hat Trick! Great job on your hat trick! Sounds like it was a great way to get motivated. Sometimes you really need that outside push to kick it into a new gear. I find it really interesting that in a race of 460 people, and over half of them female, there were only 25 people in your age group. I also wonder why they use your gun time as your finish time - I rarely seen that done in race stats. Also - you have a LANAI! Oh my gosh, all I could think of was Golden Girls when I read that. I've done a few virtual races and I think I'm done with them - just can't get excited about them any more. I would like to do a hat trick some time. I agree....a virtual race does motivate me to get out there because I need to be held accountable for the medal I receive. 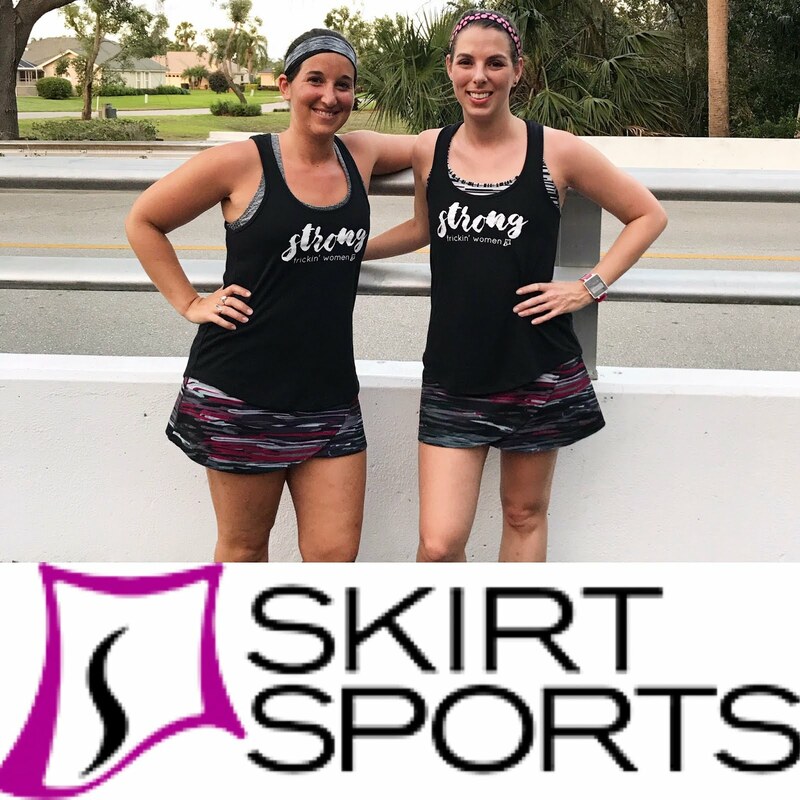 Great job on your runs this past weekend! A hat trick race? Sounds so fun!! Great job on all those runs. I have never done a virtual race, however I would definitely consider it. Sounds like some fun motivation :). Congratulations!! 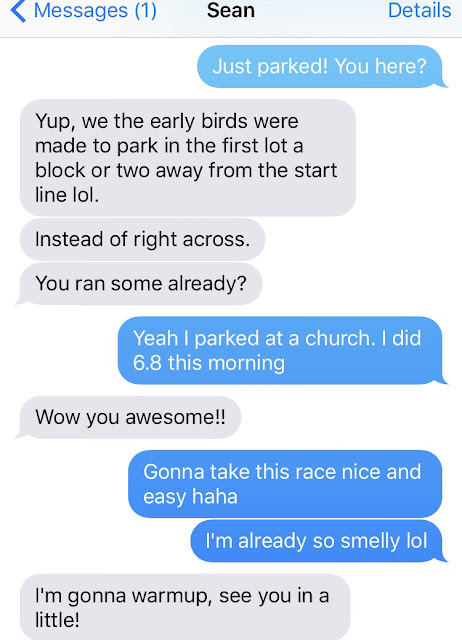 What a creative way to get in your 1/2 marathon. It must have really been nice to finish with a crowd for a 'virtual' race! !